Initially, sugar syrup has to be prepares. It should be single thread consistency. For making the syrup, boil the water and add sugar. Stir to avoid the burning of sugar. When the water becomes sticky check the consistency with spoon. In another pan, take the solidified ghee and beat it hard with eggbeater using ice cube. When the ghee turns white, add milk, flour and water. Mix well so that a smooth batter is ready. To this add colored water. (in water add yellow food color ). You can also add more water if the batter is thick. Actually, the batter to run easily when poured with spoon. Next, in another pan, heat oil. When it is smoky hot, very slowly and carefully pour the batter in the center of the oil. While pouring the batter, you must be extremely vigilant to avoid any mishap! After the foam has settles, add one more glassful of batter in hole formed in center. Again, after the foam relatively settles, using an iron skewer, loosen the 'ghevar'. And place on a wire mesh. Take this 'ghevar' and dip in the sugar syrup. Allow it to stand for sometime on mesh so that it rains excess syrup. Let it cool and garnish it with silver foil. You can also put drops of saffron milk on it and sprinkle chopped dry fruits. 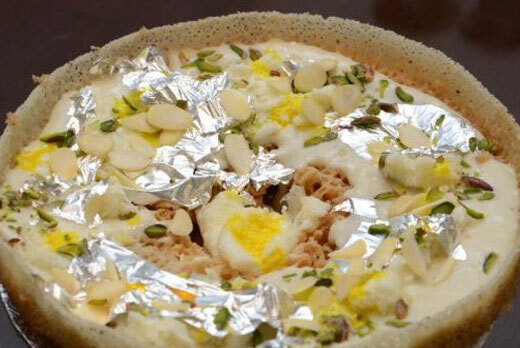 Tip: Instead of using silver foil, you can also decorate 'ghevar' with 'rabri' prepared from milk. But this 'ghevar' cannot be kept for three to four days. Ready!